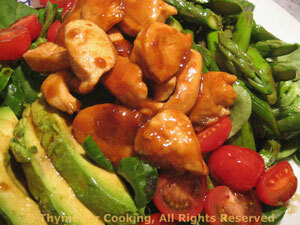 Thyme for Cooking Dinner tonight: Chicken, Asparagus and Avocado Salad. I used spinach and mâche or lamb's lettuce for this salad, but use whatever looks good in your market. Add any other vegetables lurking in the fridge, and serve with some crusty bread. Quickly blanched asparagus, stir-fried chicken and sliced avocado go together quickly for this simple, spring salad. Some crusty country bread is the perfect accompaniment. Snap off asparagus ends. Peel if using white. Cut asparagus into 1 1/2" (4cm) lengths. Bring a medium saucepan half full of water to a boil over medium high heat. Add asparagus and blanch for 2 minutes (3 for white). Remove, drain, rinse thoroughly with cold water and drain again. Remove avocado from shell and slice. Heat oils in a medium skillet over medium-high heat. Add Teriyaki sauce and chicken; stir-fry 5 - 7 minutes until chicken is cooked through. Mix Teriyaki sauce, vinegar and sesame oil. Arrange salad greens on two plates. Divide chicken and place in the center. Arrange avocado slices on one side, asparagus on the other. Drizzle a bit of dressing over all and serve, remaining dressing on the side.